Last week I won a book of my choice and I chose Through the Ever Night even though I still haven't read the first book. So, this week's Wishlist Wednesday pick I am selecting Under The Never Sky. I'm still trying to save some money to order it but I'm sure I'll get it soon enough. I WANT TO READ CINDER ASAP!!!! I've shown some interest in it lately, and I want it NOW! Too bad I can't buy it in the near future. :D Maybe I'll get it for my birthday, in April. I hope you can both get hold of these books soon- I have read them both and think they are both FANTASTIC! They are very different and such a good story. I loved Cinder! Under the Never Sky is sitting on my shelf waiting to be read. I just purchased Cinder with Christmas gift money! I can't wait to read it either. I have been on the fence about Under the Never sky but, I do plan on reading it. I hope you get your books soon and enjoy them! Hope you both get your wish. I enjoyed reading Cinder! Haven't read Under the Never Sky though. Hope you two will get your choice of books soon! Thanks for stopping by my WW. I LOVED Cinder and I still need to read Under the Never Sky :) Awesome choices! Thanks for stopping by My WW! I loved both of these. Hope you get them soon! I loved Cinder!!!!!! You are going to really enjoy it, surely. I hope you get your hands on it soon! 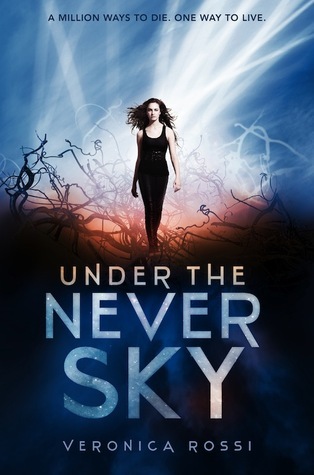 I just finished Under the Never Sky yesterday, and loved it! Cinder is good, too!